The reception is free and open to the public. Meet the artists and curators. Light refreshments will be served. As both a personal and collective symbol the table can represent unity and isolation, public and private, acceptance and exclusion, family and the individual. We have all experienced feeling welcome or unwelcome at literal tables, in spaces and places of power and influence, or in the systems that serve society. Eight regional artists, some exhibiting for the first time, guide us into a world of the table as metaphor. Photographs give glimpses into the bonds of families who survived the Holocaust and elders in our society whose stories have yet to be honored. Drawings and paintings illustrate the experiences of immigrants from Haiti and Iran as they attempt to recreate a culture of connection in a new land. Installations inspire the lifting up of personal stories of acceptance and the experience of separation due to race, gender, age, or economics. And images capture people who, with tenacity and love, have built their own tables. The exhibition asks visitors to reflect on their own narratives and the lived experiences of others by asking: Who sits at these tables? Who doesn’t and why not? How do individuals and communities create their own spaces for connecting, learning, supporting, and leading? 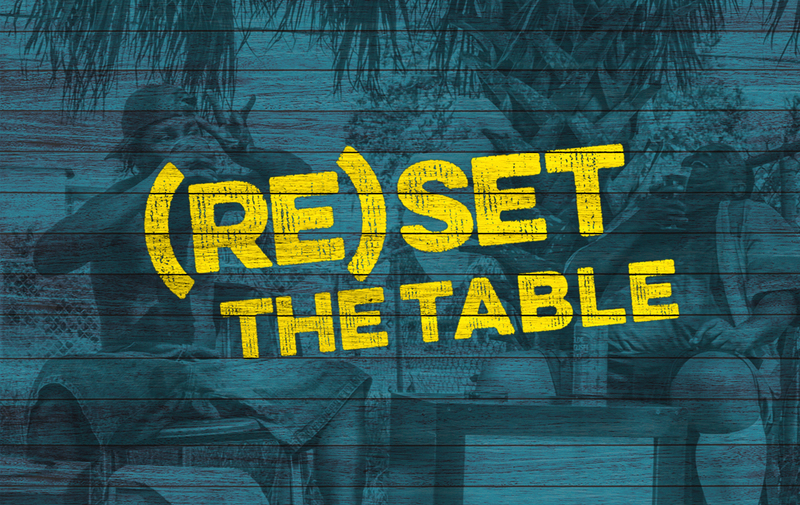 What role do we each play in resetting the table? “(Re)Set the Table” is a curatorial project of a diverse and creative group of students at the University of North Florida. Representing the fields of studio art, art history, anthropology, and communications, these students worked with Yellow House to create, curate, and program this exhibition. By integrating artists, collaborators, and emerging creators and academics, the process of conceiving and planning “(Re)Set the Table” created a community in its own right, giving voice to young leaders and stories that need to be both told and heard.